The Guru and Sanaatanadharma go together. The aspirant, sadhaka, seeks the unification with the Divine with the aid and blessings of his Guru, who makes the ascent both possible and easy. 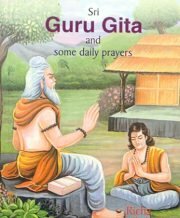 The Guru, Preceptor, is one, who out of love and compassion for his sishya, disciple, guides and leads him forward to attain Moksha, liberation or salvation. Dr. V. V. B. Rama Rao (b. 1938) retired as Head of the Dept. of English from the renowned Maharajah's College, Vizianagaram (Andhra Pradesh). A retired ELT expert, he has a lot of published work, thirty books, hundreds of ciritical essays and reviews to his credit. He writes both in English and Telugu. He is a novelist, short story writer, biographer and critic. He translated widely from Telugu to English and English to Telugu. Dr. Rao's publications in the field of spirituality and religion and The Joy of the divine, summary of discourses on Saundaryalahari and Sundarakaanda in viswanadha Satyanarayana's Ramayana Kalpavriksha, Durgasaptashati, Shivapuran and The Walking Shiva of Varanasi in "English and Lalleshwari Vakkulu in Telugu.